One of the most common requests for the popular SDK Pivots is to have it show historical levels, so here it is. newdigital, matfx and VRadik like this. - AllPivots_v3 indicator is on this post. - AllPivots_v3.1 indicator is here. This is updated version of AllPivots with ability to plot Woodie's Pivots (PivotMode = 5 and BasePrice = 7). - AllPivots_v3.2 indicator is on this post. - AllPivots_v3.3 indicator is on this post. - AllPivots_v3.4 indicator is on this post. - How to use this indicator by settings - read this post. - AllPivots_v3.6 indicator is on this post. Two new parameters to the new version for sessiona start/end for stock market. - SDK-Pivots-v1.3 indicator is on this post. Last edited by cja; 06-26-2014 at 12:30 PM. - Candle Display nmc indicator is on this post. This is indicator to display another timeframe on your chart, for example M15 chart with H4 candles. Coded by cja. This version works with Metatrader 4 build 600 and above. - Candle Display v1 nmc indicator is on this post. This is updated version - it now has an automatic magic number which allows multiple displays plus different display options. Coded by cja. This version works with Metatrader 4 build 600 and above. - UniZigZagChannel_midline 600+ indicator is on this post. This indicator was improved by cja for mid level added. 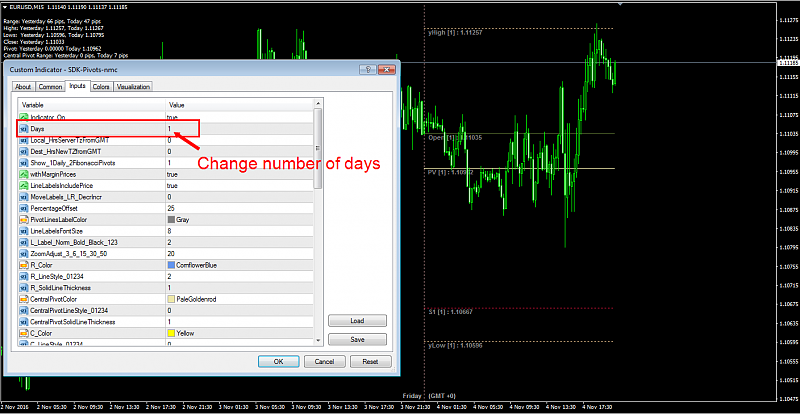 This version works with Metatrader 4 build 600 and above. Will it possible to add a function to turn off the history lines? Oh ok i'm overlook that inputs. excellent indicator could someone add please an option to set a different colour and style for each line?